Bess's Bistro | Easy. Healthy. Tasty. Winter hiatus is over for BistroBess! The days are getting longer, which means my picture taking window is as well. It’s not getting any warmer, though, as evidenced by today’s “snow storm”, so there is still time to whip up some comfort food. Namely, whip up this pasta dish. 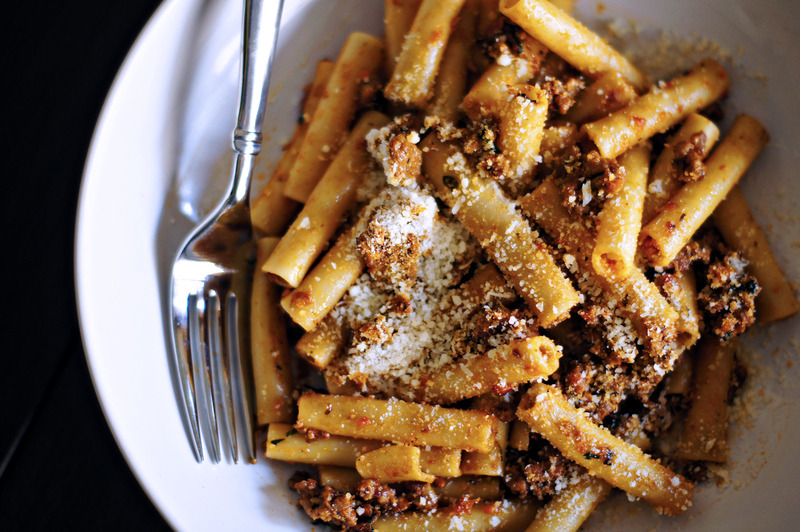 Just about every month, one of my food magazines has a recipe for a new take on ragu. Since my husband loves and is quite picky about Italian food, I only make the ones that seem both delicious and authentic. This pork based sauce hit both of those notes beautifully. 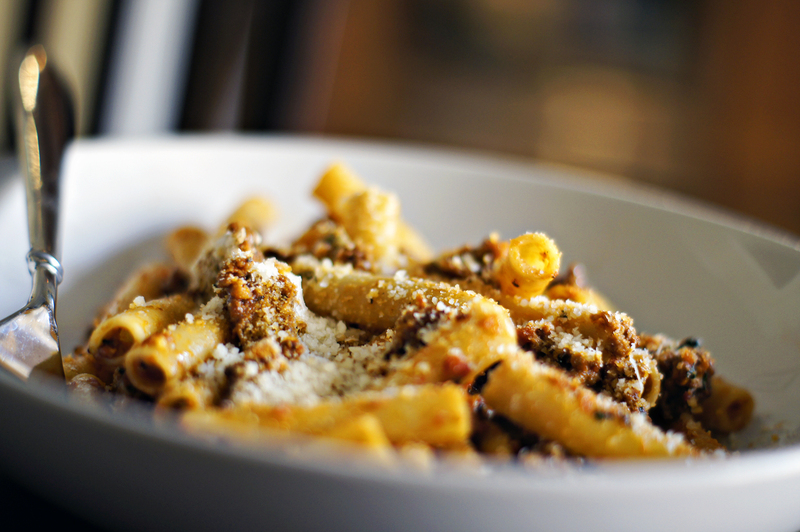 Slightly spicy, rich and thick, it coated the pasta without being too watery, as many quick cooking sauces can be. It takes awhile, close to 4 hours on the stove, but really doesn’t requite much from the chef during that time, except for the occasional stir. Also, if you are looking for some music to listen to while cooking, may I suggest The District Lights new single? Pulse onion, carrot, celery, garlic, oregano, red pepper flakes, and 1/4 cup parsley in a food processor until finely chopped; transfer to a small bowl and set aside. Purée tomatoes with juices in processor; set aside. Heat oil in a large heavy pot over medium heat; add sausage and cook, breaking up with a spoon, until browned, about 4 minutes. Add ground pork, season with salt and pepper, and cook, breaking up with a spoon, until no longer pink. Using a slotted spoon, transfer to a plate. Increase heat to medium-high. Add reserved vegetable mixture to drippings in pot, season with salt, and cook, stirring often, until golden, 8-10 minutes. Stir tomato paste and 1 cup water in a small bowl; add to pot. Cook, scraping up any browned bits from bottom of pot. Bring to a boil, reduce heat, and simmer until liquid has almost evaporated, 6-8 minutes. Add reserved meat and tomato purée and 1 cup water. Bring to a boil. Reduce heat; simmer, adding more water as needed to keep meat nearly submerged, until meat is tender, about 4 hours. I ended up adding about 2 cups of water over the course of the cooking time in small increments, adding none in the last 20-30 minutes. Taste, season with salt as needed. Cook pasta until al dente. Drain, reserving 2 cups pasta cooking liquid. Add pasta and 1/2 cup pasta cooking liquid to sauce; stir to coat. Stir in 1/4 cup Parmesan and remaining 1/4 cup parsley. Increase heat to medium and continue stirring, adding more pasta cooking liquid as needed, until sauce coats pasta. Divide among bowls; top with more Parmesan. So, quick note here… Bess is out of town. This is her husband, James. 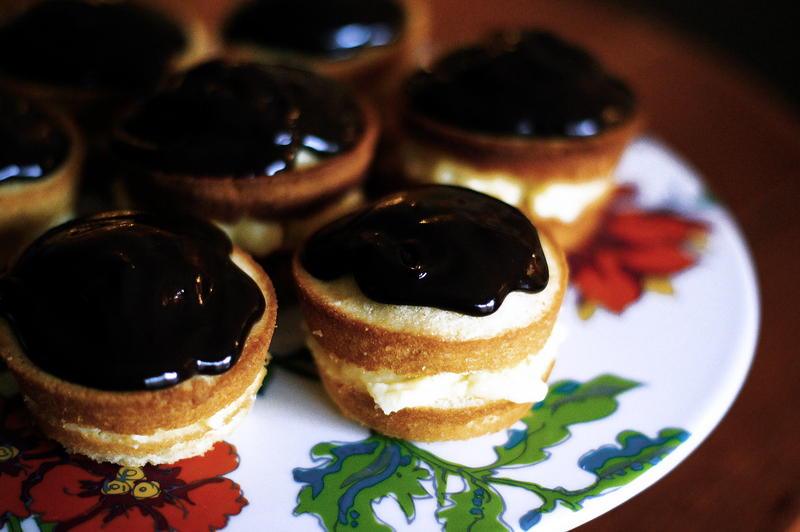 I take the photos on the site, and I eat everything Bess puts up here. No, I know, I am incredibly lucky. Trust me. This is never more evident than when Bess is out of town. Usually it’s a couple days, and I can fend for myself with any frozen stuff she leaves behind for me… for instance, she made about 20 pounds of her bolognese for me to make pasta when I need to. She also left instructions on how to roast broccoli. Because I need vegetables. Listen, scurvy is nothing to laugh at, and in this case, with Bess being gone for maybe the next 10 – 15 days, you can’t be too safe. I’m not a complete idiot when it comes to being on my own though. Let’s get that straight. It’s not like I’m your stereotypical dolt of a husband from your average sitcom. I can handle myself if I have to. Of course, that all stops with food. I am abhorrently incompetent in the kitchen, so much so that I’m fairly certain I suffer from a yet to be classified disability that prevents me from being able to prepare a simple meal. Modern medicine will one day discover that millions of people have this acute disorder, and we will be forgiven for all the times we burnt the toast, served pink chicken, carved up an overdone steak, or presented guests with runny eggs. But until then, we have to just hope we meet someone like my wife who can ensure our longevity past 35 through tasty, (mostly) healthy food like hers. I am pretty sure if it weren’t for Bess, I’d be pushing 300 pounds from a steady diet of Papa John’s and, on special occasions, chicken fried rice from the local Chinese delivery spot. I am not exaggerating. So this morning, I’m pretty proud of myself. 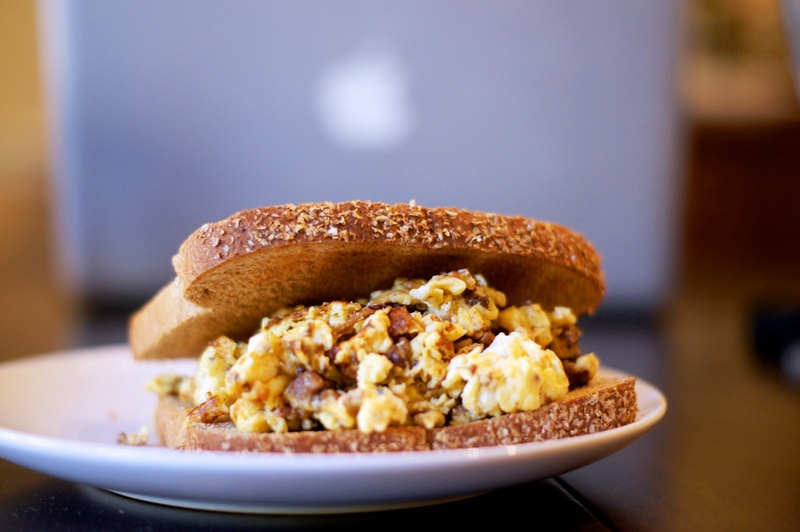 I know how to scramble eggs… I mean, who doesn’t? But we had some chorizo (spanish for “Thank you, Jesus”) left in the fridge and I figured I’d experiment with the old “scrambled eggs with melted cheese” recipe I’ve been kicking around since college. That’s right, college. I went there. Unbelievable, I know. Anyway. This is my best attempt at trying to help the other dolts like me out there who couldn’t hold a spatula right unless someone showed them. Should you find yourself with the following ingredients and about 15 minutes to whip something quick up, this isn’t too hard, and it’s darn tasty. 3 eggs if you’re especially hungry. Or, in my case, breathing. 1.5 oz ground chorizo, or half a link from the package. 1 piece of American cheese. 2 pieces of bread. Any kind, what do I look like? Your bread guy? Like, a smidgen of oil. Healthy dose of humility in the event that you fail. Crack eggs in a bowl with a splash of milk. Whisk the eggs and the milk to a froth. Tear up a piece of AMERICAN cheese, none of that foreign stuff. Drop the cheese in the egg mix. OK, now go over to your stove, assuming you have one, otherwise what are you doing here? Dummy. Heat a pan. I don’t know what they’re called, but it’s like an inch deep. Add the smidgen of oil (that’s a thing right?). Heat to… just heat it up until you can throw a little water in the pan to test to see if the oil sizzles. That’s James Science for seeing if it’s ready for the chorizo. Add the chorizo, mash it up. This stuff cooks quick so don’t be an idiot like me and make a phone call when you put it in, otherwise you’re going to burn it and the fire alarm WILL go off. This is the most annoying part about cooking. You know what? It’s probably a best practice to just remove the smoke detector before you cook. Once browned, scoop the chorizo out and put it on a small plate with a paper towel to soak up the grease. Because. Come on… What are you, an animal? Get rid of the grease, trust me. Drop the egg froth mix with the cheese in the pan. After a couple minutes, add the chorizo. Stir until it all co… oh crap. Put the toast in. Do that now. You should have done it back when you took the chorizo out, FYI. Don’t worry, I made the same mistake. OK keep mixing those eggs and the chorizo. Smell that? Something’s burning, turn down the heat to like medium. Keep stirring until the eggs are cooked and then move the pan off the heat. Take a minute to clean up, trust me, you’re going to get a look from your sig-oth when they come home, and it’s going to be because you left the pan on the stove with some egg and chorizo still in there. All because you were distracted by a Youtube video you saw on Reddit and well, there went your Friday. Alright the toast is done, go and get it out. 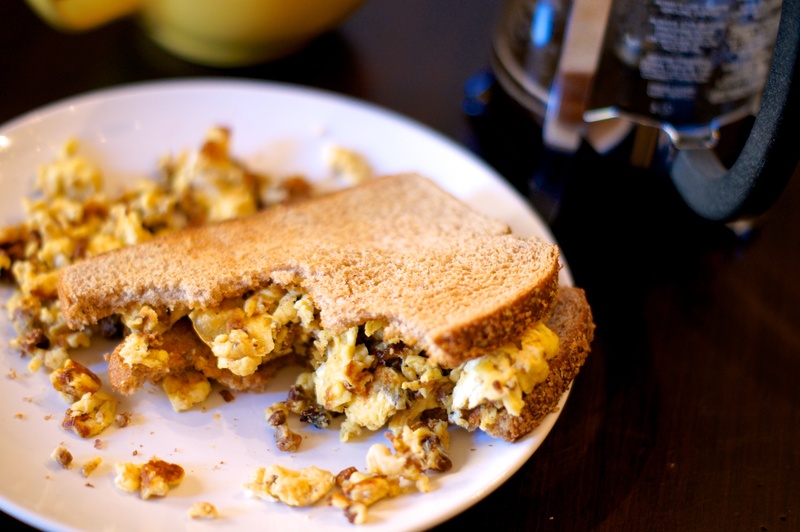 Now add the egg and chorizo mix to the bottom half of the toast and put the second piece on top. I just told you how to make a sandwich, so if you’ve gotten this far, you know you really needed help with the whole cooking thing. In all seriousness, this is pretty tasty, and I survived the whole process. Speaking of survivors, if you were wondering where Bess is, she’s up in New York and New Jersey helping folks out who were hit hard by Hurricane Sandy last week. Every effort counts, there are still people without power… there are still people without a home. Please donate to whatever charity you prefer with a mission in those areas affected by Sandy, or for more information on how you can help support the recovery effort, visit http://www.serve.gov/sandy. I will occasionally put a recipe on the menu, but not have high hopes. This tends be the recipe that falls victim to a night of not feeling like cooking, a night of going out instead and a night of my husband being really sick. I was pretty sure this recipe was destined not to happen. Until last night, when I realized I had all the ingredients, and it would take me less than 30 minutes to pull together (not counting deveining the shrimp, gross). I am so glad I made it! 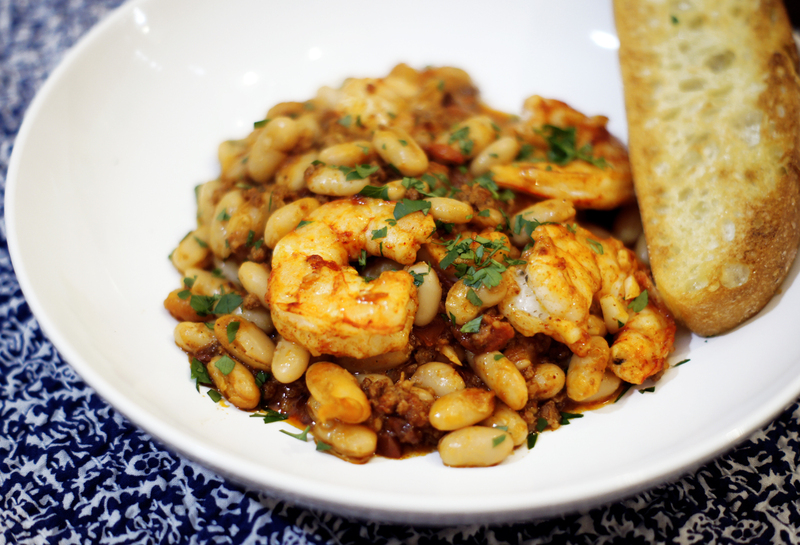 This was a great weeknight meal, easy to pull together, with really great flavors. It was filling, but not heavy. I made some minor changes to the original recipe, notably adding Mexican style chorizo, and, since my store does not carry them, substituting the chiles de arbol with a few dashes of cayenne pepper. 4 oz Mexican style chorizo, removed from casing *This chorizo has a crumbly texture, unlike the Spanish version, that blends into this sauce nicely. Heat a large, heavy, ovenproof skillet over medium heat. Add the chorizo, cook and crumble with the back of a wooden spoon for about 3 minutes. Add an additional 1 TB of olive oil, 1 garlic clove, chiles or cayenne pepper, and bay leaf and cook, stirring constantly, 1–2 minutes. Add tomato. Cook, stirring and smashing tomato with the back of a wooden spoon, until tomato is completely broken down, about 5 minutes. Add tomato paste and cook, stirring constantly, until paste is deep red and caramelized, 3–4 minutes. Stir in beans and broth. Bring to a brisk simmer and cook until juices are slightly reduced and thickened, 3–4 minutes. Season to taste with salt and pepper. Combine remaining 2 garlic cloves, 2 TB oil, shrimp, and paprika in a medium bowl; season with salt and pepper and toss to evenly coat shrimp. 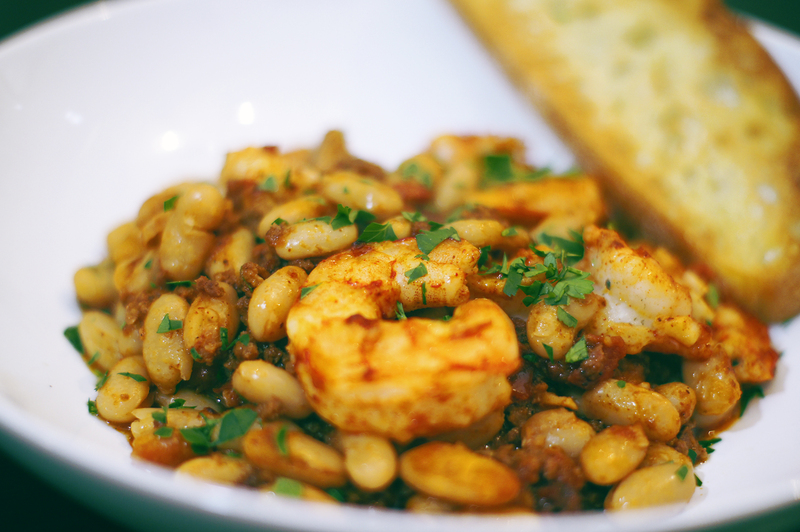 Scatter shrimp over beans in an even layer. Broil until shrimp are golden and cooked through, about 5 minutes. Garnish with parsley. Serve with bread for soaking up the sauce. It must be Taco Week here at BistroBess! 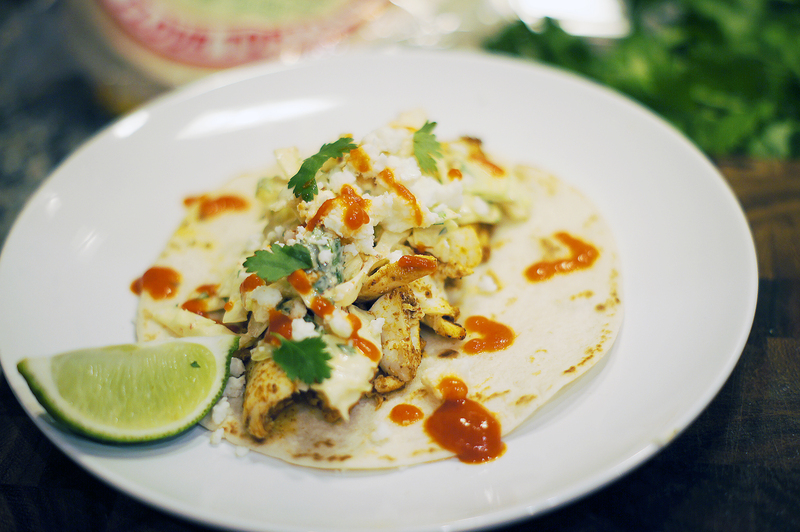 Today I have another spin on classic tacos, this time with an Asian flair. Fusing the classic Mexican taco with ingredients from other countries, particularly Korea and other parts of Asia, is a big culinary trend right now. Many credit this to the popularity of food trucks, which use the portable taco as the perfect vehicle to deliver a variety of flavors. One of my favorites here in DC is TaKorean, which I recommend you seek out for lunch some day soon. 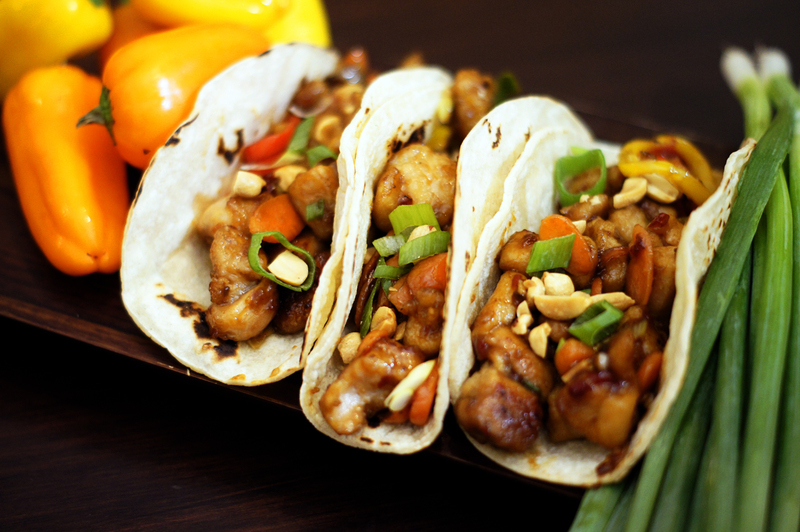 These Kung Pao tacos are packing some heat, thanks to a healthy dose of fresh chile paste. Sambal Oelek is available at most grocery stores in the Asian section. It can be potent, so use with caution! Place chicken in a large zip-top plastic bag. Add 1 tablespoon soy sauce to bag; seal. Marinate at room temperature for 30 minutes. While chicken marinates, combine 1 1/2 teaspoons cornstarch, remaining 2 tablespoons soy sauce, honey, and next 4 ingredients (through garlic) in a small bowl, stirring with a whisk until smooth. Set aside for later use. Place 1/4 cup cornstarch in a shallow dish. Remove chicken from bag and add to cornstarch in dish, and toss chicken to thoroughly coat. Shake off excess cornstarch. Heat a large skillet over medium-high heat. Add 1 tablespoon canola oil to pan; swirl to coat. Add half of coated chicken; sauté for 6 minutes or until done, turning to brown. Remove chicken from pan using a slotted spoon; drain on paper towels. Repeat the procedure with remaining 1 tablespoon canola oil and coated chicken. Set chicken aside. With the heat still on medium high, add remaining canola oil, if needed. Add onion, pepper and carrot and sauté until crisp tender, about 2 minutes. Put chicken back in the pan, stir in soy sauce mixture. Sauce should thicken up and coat the chicken and veggies. Top heated tortillas with the chicken and veggie mixture. Sprinkle on chopped peanuts and garnish with extra green onions, if desired. These fish tacos take the standard beef-lettuce-salsa-cheese formula and lighten it up, while also adding flavor and spice. It may seem a bit fancy, but still come together in about 30 minutes. Fish filets are ideal for weeknights, since they cook up quickly, and pre-shredded coleslaw is a great time saver. Perfect for your next Taco Tuesday. Or Wednesday. Or any day, really. *I now expect at least a dozen taco hating comments. Mix first 6 ingredients (through cayenne) with 1 TB of olive oil to form a paste. Rub the spice paste all over the fish, cover with plastic wrap and place in the refrigerator to marinate for a few minutes. While fish marinates, make the coleslaw. 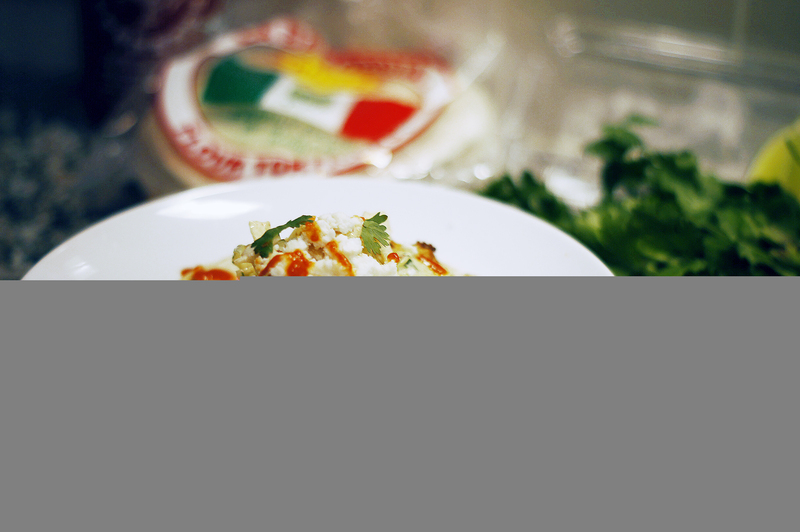 Place the cabbage, green onions and cilantro in a large bowl. In a small bowl, mix the sour cream, chipotle, lime juice, sugar and a pinch of salt. Taste for spiciness and seasoning, add more chipotle or salt if needed. Combine sour cream mixture with vegetables. Refrigerate until ready to serve. Heat the remaining olive oil in an oven proof sauté pan over medium high heat. Add fish filets; allow to cook about 3 minutes. Flip and put in oven to finish cooking. Cook time will depend on the thickness of the filets; usually about 5-8 minutes. While fish cooks, heat tortillas in a dry pan or in the microwave. Remove fish when done, and using a fork, flake the fish into bite size pieces in the sauté pan to coat in seasoning. 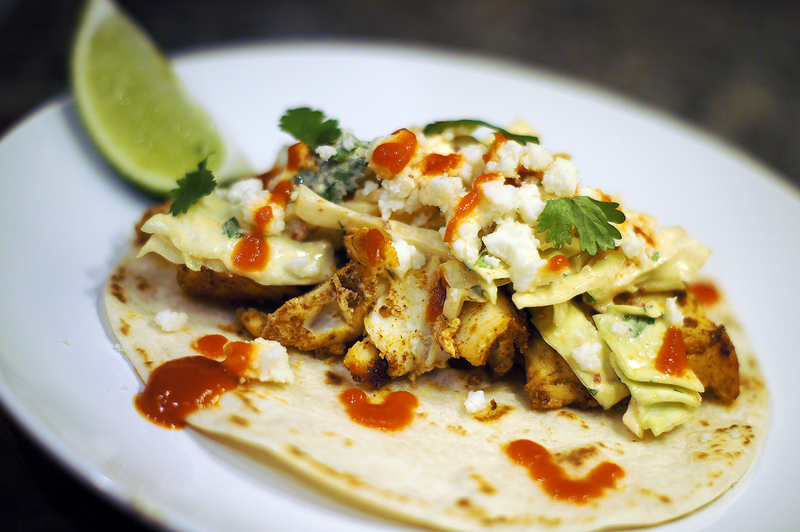 Assemble the tacos by placing fish, coleslaw, queso fresco and hot sauce on a corn tortilla. Bananas are the only fruit I genuinely hope we don’t finish during the week. Throwing away shriveled grapes or moldy clementines makes me sad, but a pile of brown bananas puts a smile on my face. Time to make banana bread. The classic recipe from The Joy of Cooking is my go to, and it’s lovely, but this month’s Cooking Light (surprise) featured an entire spread on quick breads. I am dying to try the sweet potato bread and the maple stout loaf later in the fall. 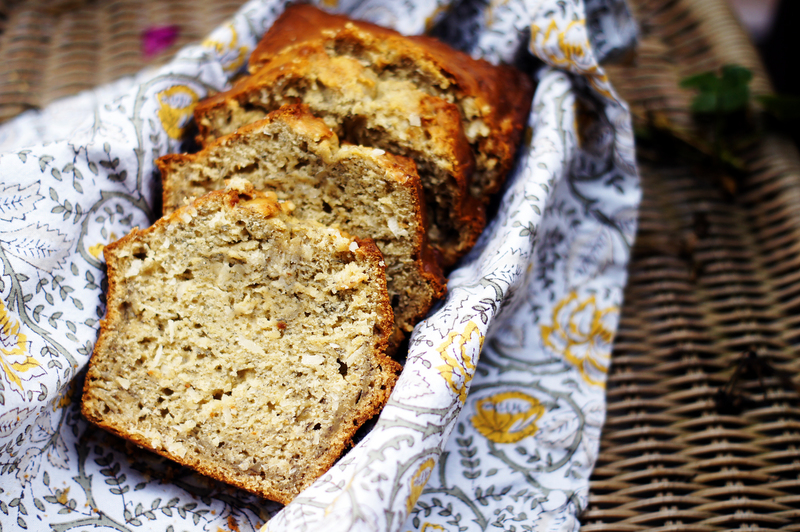 But this week called for banana bread, and this recipe did not disappoint. The flavor of the caramelized bananas really adds depth. The original recipe called for a glaze,which I skipped. I did add coconut, and it was a nice little addition of both flavor and texture. Melt the butter in a large skillet over medium-high heat. Add brown sugar and bananas; sauté 4 minutes, stirring occasionally. Remove from heat; cool 10 minutes. While the banana mixture cools, combine buttermilk and next 3 ingredients (through eggs) in a small bowl (or in the measuring cup you measured the buttermilk in to save dishes). Combine flour, baking soda, and salt in another small bowl. When the banana mixture has cooled, place in a large mixing bowl, and beat on medium speed until smooth. Add flour mixture and buttermilk mixture alternately to banana mixture, beginning and ending with flour mixture, just until combined. Fold in coconut, if using. 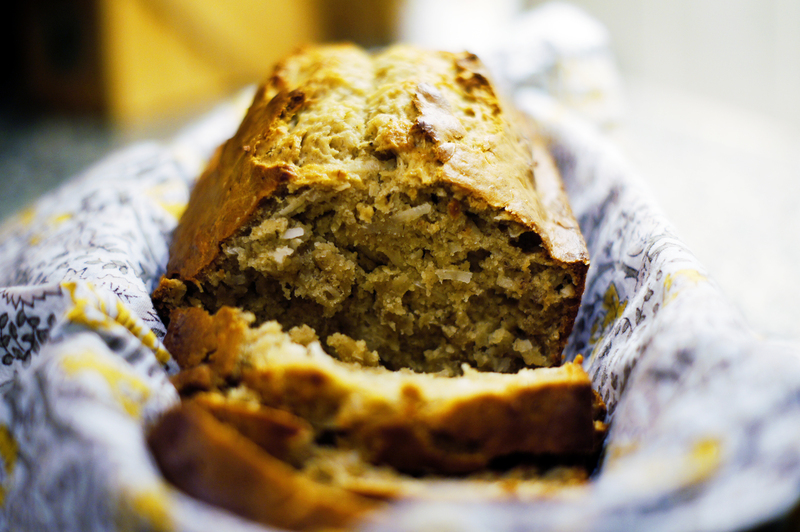 Scrape batter into a 9 x 5-inch metal loaf pan coated with baking spray. 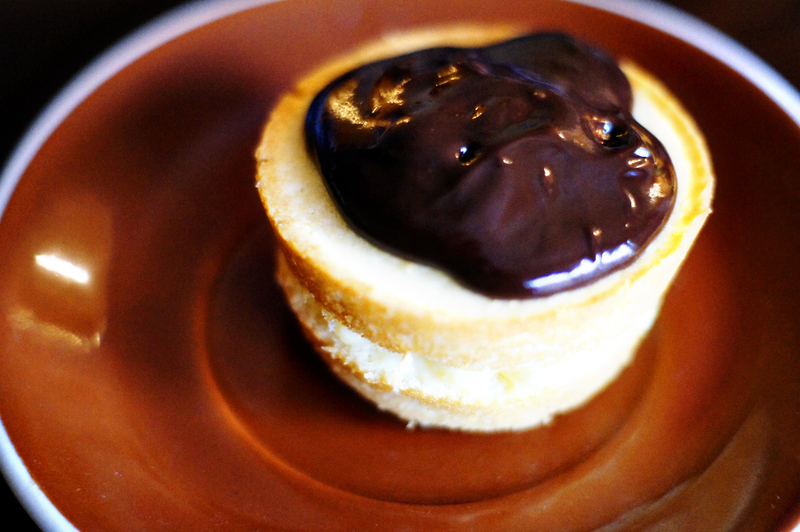 Bake at 350° for 1 hour or until a wooden pick inserted in center comes out with moist crumbs clinging. Cool for 10 minutes in pan on a wire rack. Remove bread from pan, and cool on wire rack.